A few weeks ago as we sat at the dinner table, my son picked up his napkin and put it to his forehead. “Well,” he sighed, “I’ve got a new tic.” He removed the napkin to show us his eyebrows raised on his forehead. Then he waggled his eyebrows like Groucho Marx…except my boy didn’t do it on purpose. This might have seemed amusing if it wasn’t a tic. 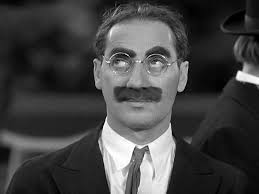 If he just wiggled his eyebrows to be funny, then we’d probably find him a hat and fake glasses and show him YouTube videos of the Marx brothers to explain who he looked like and why it was funny. But as my son continued to sigh throughout dinner and kept his napkin covering his face, it was no laughing matter. This past summer, Bri’s body (or rather his body’s reaction to anxiety) created a tic that physically hurt him. He started to nod his head in a very quick, jerky movement. Sometimes the nodding is up and down as in “yes,” and sometimes it’s a shaking of the head as in “no,” although typically it’s the former. There are times when the nodding is so frequent, that I’ve had to ask him to answer me verbally when I ask a question. On at least one occasion, I asked him something and didn’t hear him answer “no” but he was nodding his head as in “yes.” He got upset because of the confusion, but hopefully the verbal responses will help in the future. What’s even more upsetting is that sometimes after a particularly bad day, he’ll try to settle down at bedtime but will cry out to me, “Mom, my neck really hurts!” I always respond with a visit to his room and many whisperings of “I know, sweetie, I know” and light massages of his neck. Although my son has had transient tic disorder for a few years, it seems to be getting more difficult for him to handle. Or rather he is more aware that the tics are happening. I am grateful for at least the rotation of the tics, the fact that one particular movement will go away for at least a little while. For instance, he doesn’t blow on his hands like he used to. He might start again tomorrow, but right now that’s not what his body feels is necessary. I just keep hoping the nodding of the neck will disappear soon. The fact that this tic is hurting his body scares me. I’ve read about folks with Tourette’s Syndrome and how the various jerky movements negatively affects their bodies. How could it not? The most disturbing aspect of all this though, was watching my little boy’s body create a tic while we had what we thought was a relaxing dinner. It had not been a bad day and it had been a good evening. I keep asking myself, “Why does his body do this? Why does it react to stress and anxiety this way, even when it’s not a particularly stressful day or moment?” I don’t have specific answers and yet I know from observation that he tends to tic more at night, no matter what his day has been like. 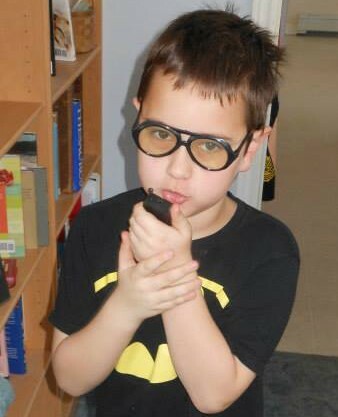 I do think he tries to resist the tics while at school. (I’ve seen him at a birthday party try to hold his face still and open his eyes wide so he won’t squint and scrunch his eyes.) Once he gets home, he knows he can be himself and I think his body just lets it all out and it tics like mad–eye scrunching, eyebrow raising, head nodding, blowing on the hands–the whole kit and caboodle. But this morning? This morning I wasn’t thinking about anxiety or body tics or deep breathing exercises or any other kind of stress reliever. I was only thinking about getting our four cats outside so they’d stop bugging me. And as I let them out, I heard my son waking up. I didn’t know it, but I was about to receive a very special gift. Typically my husband, the early riser, is already awake but this morning he slept in. I whispered to my son that he could get up if he wanted to, but we had to be quiet. So we went into the kitchen and quietly talked about what we dreamt the night before while we made tea and coffee for ourselves. (Don’t worry, decaf tea for him!) Then we tiptoed into the living room, sipped our drinks in front of the lit Christmas tree (yes, you read that correctly) and talked about video games, my sister’s 50th birthday, our freaky cat we secretly think is Batman, and ghosts. And near the end of this lovely conversation? I realized that my sweet boy hadn’t tic’ed once. I love my son more than anything that has ever existed in this world. I’ll love him if he dyes his hair purple or turns into a yeti. I love him and all his eccentricities and goofiness and bad jokes. And I love him with his tics. But I also love him without his tics and can appreciate those few moments when his body and mind are calm and happy and in sync.